Hi all! It's time for this week's Sweet Stop Sketch! I used this cute little butterfly from Bitty Bugs (a digi image). The matted main image and two of the flowers are up on foam tape. Stardust Stickles were added to the edges of the wings. Isn't this a great CAS sketch?! I love it! 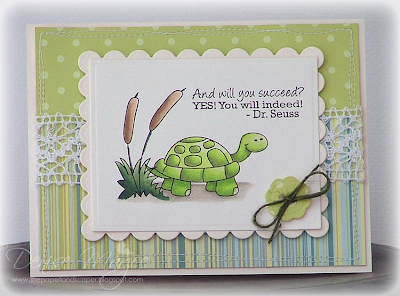 OCL Blog Hop and Giveaway! This is my favorite set from the release. All you have to do to enter to win the set is leave a comment on this post or either of my sneak peek posts from the last two days no later than Sunday the 27th at 3 a.m. Eastern and you'll be entered. I'll announce the winner here on my blog sometime on Sunday night or Monday morning. All winners will also be announced on the OCL Blog. I used Cryogen irridescent shimmer CS for the main panel, colored the images with Copics, and put the scalloped rectangle up on foam tape. The paper button is up on foam tape as well. Here's the full list of blog hoppers. You'll want to hop around and leave comments because EVERYONE has a set up for grabs today. Thanks for stopping by and good luck in the drawing!! Hi all! I have another sneak peek of Joy in the Little Things. The mushrooms and sentiment are up on foam tape. Here's the list of everyone else participating in today's sneak peeks. Come on back tomorrow to see which new set I'm giving away. It's a cutie! Hi all! I have some sneak peeks to show you today and tomorrow on a brand new set from Our Craft Lounge, called Joy in the Little Things. The cloud, button, and scalloped rectangle are all up on foam tape, and I added stickles to all the hearts on the mushroom as well as the snail's antenna. 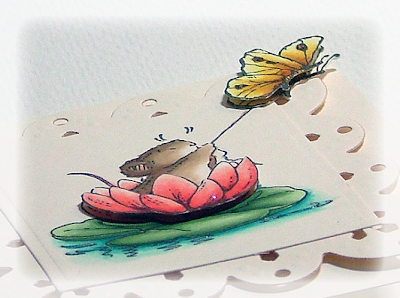 On Friday, we're going to have a blog hop and I'll be giving away a brand new stamp set. I don't think I'm supposed to tell you just yet which set I'm giving away...but stay tuned for that on Friday. It's a good one, I promise! If you leave a comment on this post today, my sneak peek post tomorrow, OR the one on Friday, you'll be entered to win the set. I'll draw a random name and the winner will be announced here on my blog on Sunday night or Monday morning. Man, was I ever in a stamping FUNK last week.....I didn't really feel like creating, then when I did finally feel like it I couldn't seem to color anything I was happy with, which put me right back into a funk! During yesterday's race though, I was FINALLY able to get something colored....yayyy! The main image with the sentiment tab is up on foam tape. Stickles were added to the hair clip, blue sash, shoe buckles, and music notes. The scalloped oval is up on foam tape an I added Stickles to the hair clip and butterfly wings. Oh yeah! I've been thinking spring since...ohhh, I don't know....January 1st! LOL! 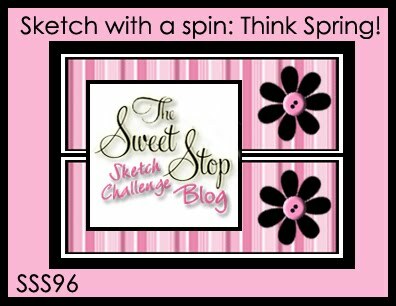 It's our "Sketch with a Spin" week on the Sweet Stop Blog....so you'll want to head over and check out all the details because there's a prize up for grabs! Yay! 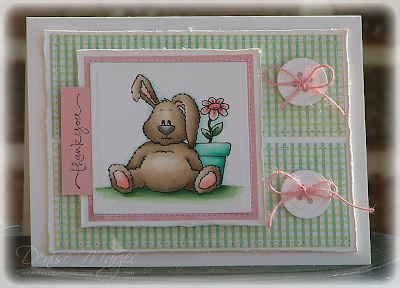 For my card, I used my Benjamin Bunny digi image and paired it up with an old SU sentiment stamp. I know, it's ridiculously old, but I love the font....and hey, old stamps deserve some love, too, right?...right. The buttons and matted main image are all up on foam tape, all the edges were distressed with my fingernail, and I added just a little bit of Stickles to the flower. Have yourself an AWESOME day!.....and think spring! I know I am! 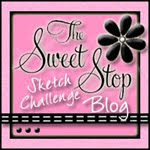 It's SKETCH time over on the Sweet Stop Blog. 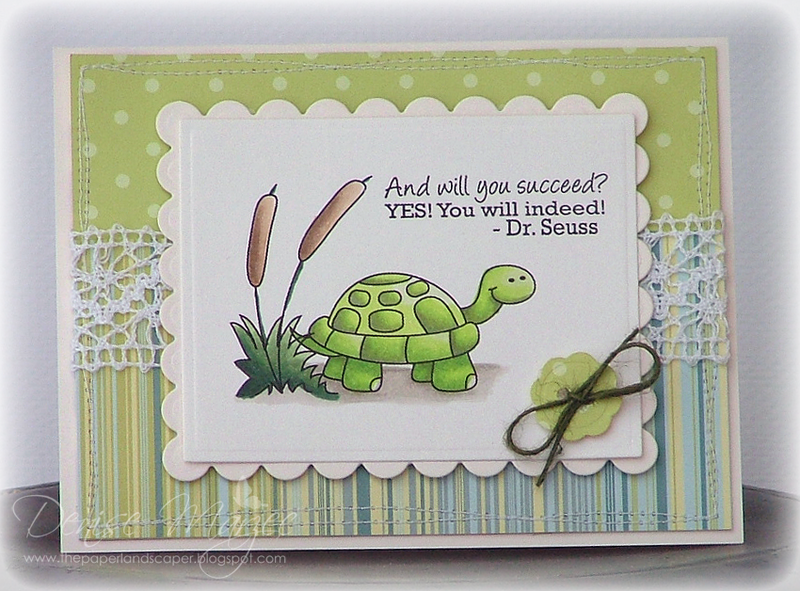 Hop on over there and check out what beautiful cards the Sugar Babies have to show you today. 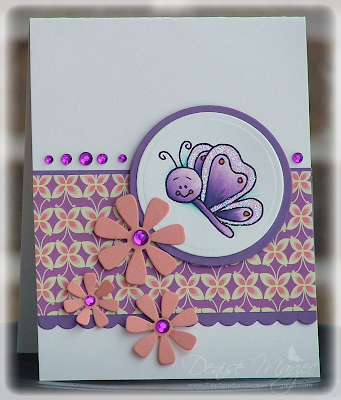 For my card, I used this sweet Magnolia image that my friend Lori stamped for me (thanks, girlie!). I added some stardust Stickles to Tilda's sleeve and lacey hem. I also added some white paint pen accents to their cheeks and on their shoes. The two paper buttons in the lower left corner, the "hugs" sentiment, and scalloped kraft rectangle are all up on foam tape. I threaded hemp twine through most of the paper buttons. The pomegranate one in the upper right-hand corner has a strip of the DP threaded through it. I've had so much fun hosting this week's challenge on the Penny Black Blog...and I hope you've enjoyed it, too. I made a little 4" square notecard for my final project for this week's challenge. You can see the entire card by clicking HERE. 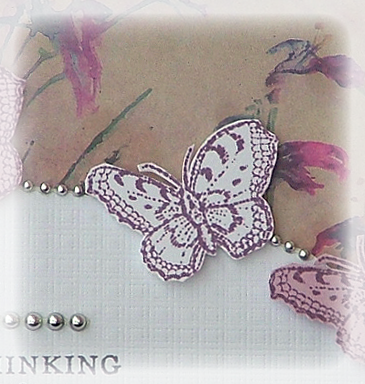 The layout is Mojo Sketch 176, the butterflies are from my Enjoy Life transparent set (all popped up on foam tape), and that pretty Field of Iris DP in the background is also from Penny Black. Don't forget, you have until Sunday night at midnight PST to enter your card/project into the Flickr Gallery, tagged with "winterwhite." 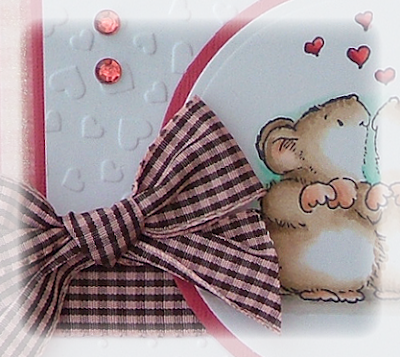 Jenyfur will announce the winner on Tuesday on the Penny Black Blog. I've had this photo hanging here at my desk for a long time now and decided it was high time to pretty it up into a scrap page. It's one of my favorite pictures of Hailey and Kara together. 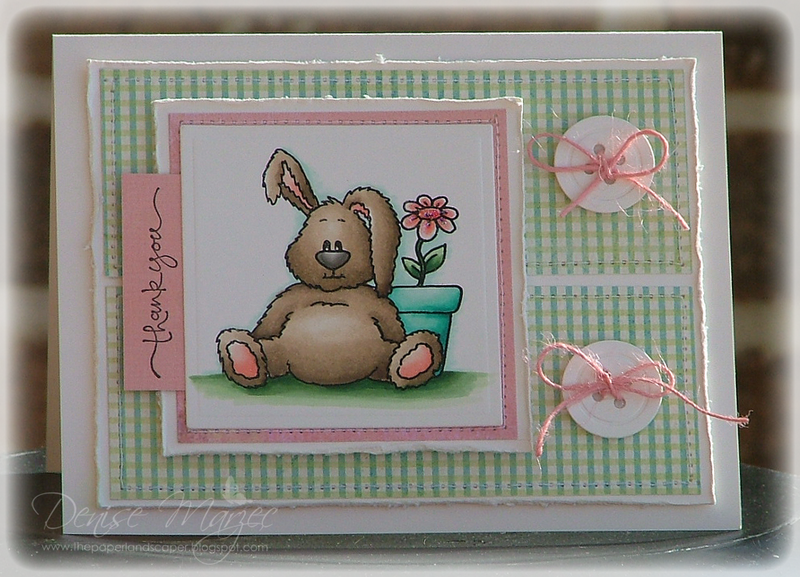 The flowers are from my Salutations transparent set and the "hug me" sentiment is a wood-mounted stamp. Three of the flowers and the sentiment are up on foam tape. 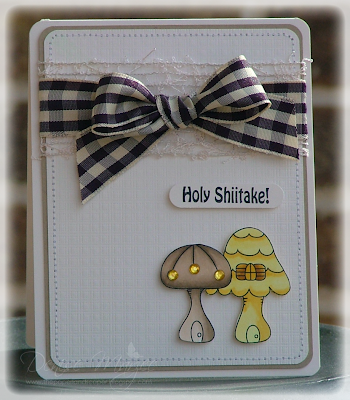 I used that embossed white heart paper and paired it up with Eskimo Kisses DP. I'll be back tomorrow with one more project for our Winter White challenge theme! Have you gotten a chance to play along yet in the challenge? Don't forget to upload your project to the Flickr Gallery, tagged with "winterwhite," and you'll be entered for a chance to win THREE Penny Black stamps or stamp sets! Hi all! Here's a peek of another card I made for this week's Winter White challenge on the Penny Black Blog. 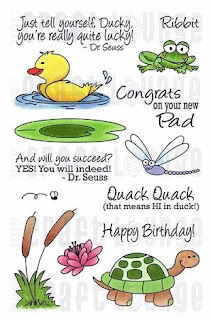 You can see the entire card by clicking HERE. 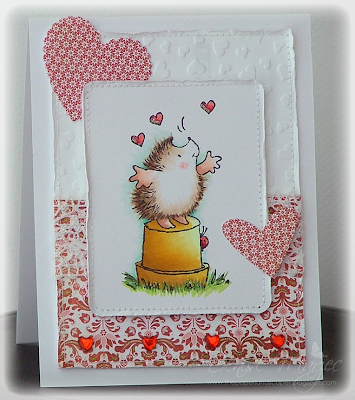 I used my wood-mounted "Snuggle" (mice) and "Hugs and" (sentiment) stamps. The main image is up on foam tape and I used that awesome embossed white heart paper again...love it! Stamps: 3316F "Hugs and", 3343H "Snuggle"
Hi all! We've changed things up a bit on the Penny Black Blog. Starting this month, we're now holding weekly challenges for our readers...and this week *I'm* your hostess! 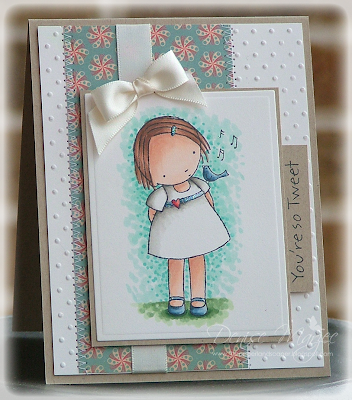 :) The challenge this week is to use Winter White on your cards/projects. 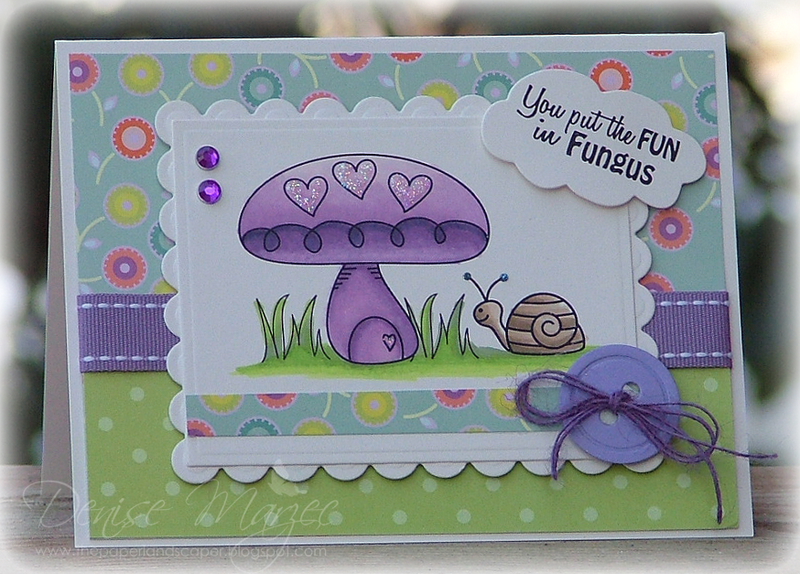 Hop on over to the Penny Black Blog, join us for the challenge, and be sure to enter your card/project into the Penny Black Flickr Gallery so we can see what you've made......and psssst.....there's a PRIZE to be won, too! Whoo-hoooo!!! I'll have cards/projects with "Winter White" all week long on the Penny Black Blog. 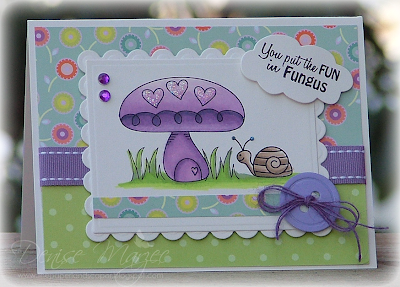 For today's card, I used my wood-mounted Top of the World stamp. The main image is popped up on foam tape and I added some stardust Stickles to the grass and hearts. The embossed white heart paper is also from Penny Black...did you know they have papers?? I love this embossed stuff! Hi all! Here's my card for today's Sweet Stop Sketch. It's a 5.25" square card. I stamped the Good Friends image twice. One image was fully colored and cut with the circle nestie. Then I colored up a second umbrella, cut that out with scissors, and glued it over the base layer. The sentiment and main image are both up on foam tape and I added Stickles on different parts of the umbrella and clothing. I know my posts have been few and far between these past two weeks....kid sickness, snow days galore, birthday get-togethers, and life....well, it messed with my creativity enough that I just didn't even feel like stamping. That's going to change though because next week I'll be hosting a week-long challenge on the Penny Black Blog and I have FOUR projects all set and ready to show you Monday through Thursday. 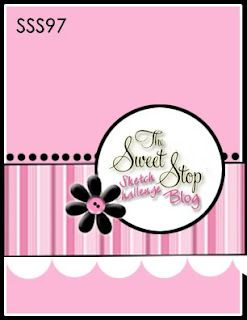 In fact, right now there's a sketch challenge going on that's being hosted by Miss Jenyfur, and you have until Sunday night to upload your cards/projects in the Flickr Gallery for a chance to win THREE Penny Black stamps or stamp sets! Check out the details RIGHT HERE on this post. ...on the MFT Blog! OMG, I'm soooooooooo excited!! THANK YOU, MFT girls, for picking my card!! You made my day!